The Bears dipped down to the mid-major level to find an inbounds play against Texas Tech's elite defense. Up single-digits with fewer than two minutes remaining against No. 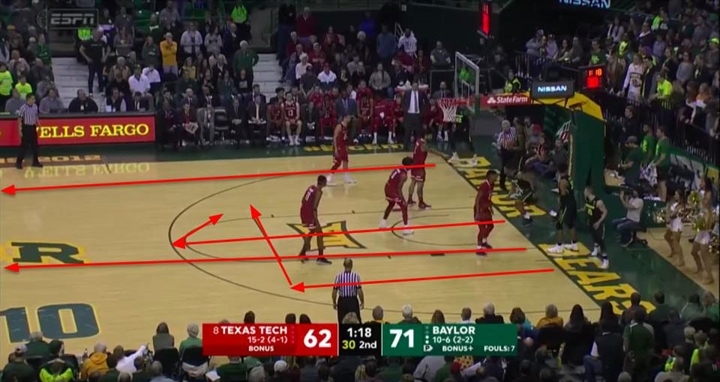 8 Texas Tech’s elite defense, Baylor basketball knew it had to get the ball in, across half court and to a good free throw shooter. Baylor coach Scott Drew is known for strong inbounds plays, but this one was unexpected. All five Bears lined up out of bounds as guard Jared Butler received the ball to inbounds. Suddenly, four Bears sprinted down, and two turned back towards midcourt. Butler inbounded the ball to shooting guard King McClure, who passed it cross-court to guard Makai Mason. He pushed the ball up the floor, where he got it to shooting guard Devonte Bandoo. Tech fouled Bandoo and sent him to the line, but he calmly nailed a pair of free throws to give the Bears a comfortable 73-62 win over the visiting Red Raiders. Any Texan sports fans watching the game could immediately tell what happened – the Bears just ran a football play. “Down here in the South, people love their football, and so do we,” Drew said with a laugh. Drew is one of the first to run this type of play at the high-major level, but he didn’t come up with the play. A Baylor source confirmed the Bears got the idea after watching Northern Kentucky run a similar play just a week earlier in a tight win over Wright State. “There’s not a ton of original ideas left,” Northern Kentucky coach John Brannen told TexasBasketball.com. Brannen saw an version of the play while watching the end of Illinois State’s tight 70-69 win over Northern Iowa. After the game, Brannen texted his friend, Illinois State coach Dan Muller, who he credits with inventing the play. Muller walked Brannen through some of the finer points of the play. More than anything, Brannen wanted to simply make sure the play was legal. Muller cleared it with the refs before running it, and confirmed it was a legal play. When Brannen proposed the play to his 17-4 Northern Kentucky team, his players were immediately excited. As soon as Brannen talked about the play, his team was excited. Naming the play was easy. Brannen called it Clemson, an homage to the 2018 national champions. Brannen planned to save the play in his back pocket for when Northern Kentucky was in a late-game situation. That came just two days later on Jan. 11, as the Norse played a tight game against Horizon League foe Wright State. NKU ran the play to perfection, and went viral in the process. The inbounds play works just like any air raid football offense. Baylor lined up with three “receivers” on the left – McClure, Freddie Gillespie, Mason – and one on the right – Devonte Bandoo. Bandoo and Gillespie ran “go” routes straight downcourt. Mason ran a dig, where he ran to the three-point line and cut perpendicular back towards the ball. McClure ran a comeback, where he ran to the three-point line and then straight back to the ball. Gillespie and Bandoo running down court helped cause confusion and open up space in the Tech defense. Mason and McClure came back to the ball so Butler would have options, but went into different space to create one-on-one matchups. After the play unfolded, McClure pushed the ball down to Mason, who threw the ball to Bandoo. It’s no coincidence that these were the players involved in the play. “It was about getting the good shooters back to the ball and getting the lesser shooters away from the ball and occupying some bodies,” Brannen said. The same was true of Baylor’s version. The ball went into McClure, a 73-percent free three shooter. He quickly moved the ball to Mason, an 83-percent shooter. Mason pushed the ball down the floor to Bandoo, a 95-percent free throw shooter. The ball only touched the hands of two seniors and the best free throw shooter on the team. It has never been easier to watch college basketball. Brannen found his play while watching Illinois State on the ESPN app. Drew credits Synergy and coaches sharing film for finding these kinds of plays. Either way, the innovation of low- and mid-major coaches is being accessed and implemented more easily than ever before. Brannen has leveraged those ideas to turn a once moribund Northern Kentucky program from 9-21 in 2015-16 to 17-4 in 2018-19. The Norse have finished with the best Horizon League record and been to the NCAA Tournament. NKU currently sits atop the Horizon League with a 7-1 record. Baylor has used innovation to win 20 or more games in nine of the last 11 seasons, including three Sweet 16 and two Elite Eight trips over that time period.